New York Times' T Magazine. What? 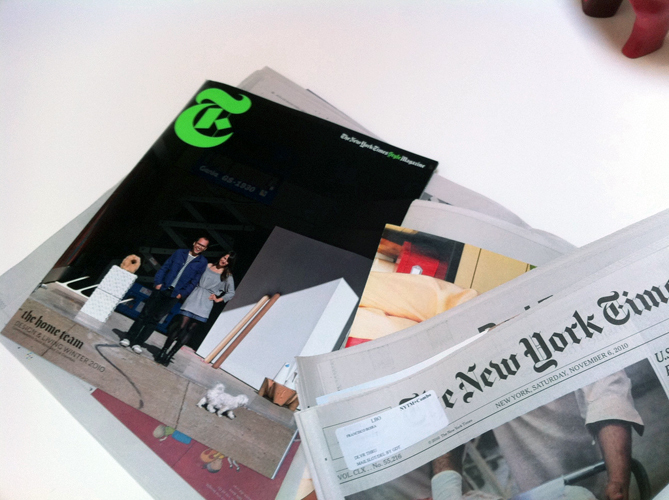 Yes, that's us on the Cover of the NYTimes Style Magazine. The Home Team: If They Can Make it Here. Story Monica Khemsurov. Photographs Tim Barber. 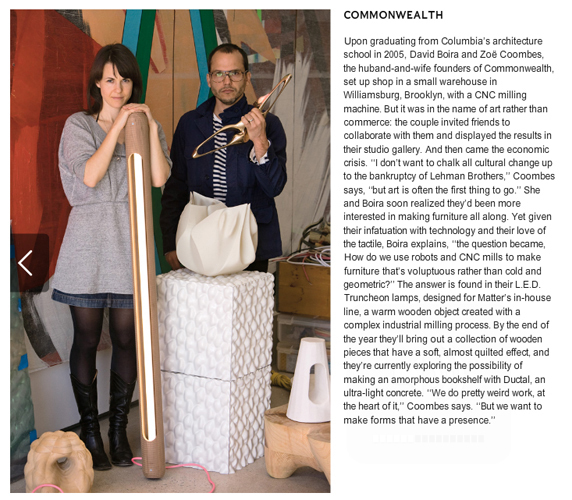 Upon graduating from Columbia's architecture school in 2005, David Boira and Zoe Coombes, the huband-and-wife founders of Commonwealth, set up shop in a small warehouse in Williamsburg, Brooklyn, with a CNC milling machine. But it was in the name of art rather than commerce: the couple invited friends to collaborate with them and displayed the results in their studio gallery. And then came the economic crisis. "I don't want to chalk all cultural change up to the bankruptcy of Lehman Brothers," Coombes says, "but art is often the first thing to go." She and Boira soon realized they'd been more interested in making furniture all along. Yet given their infatuation with technology and their love of the tactile, Boira explains, "the question became, How do we use robots and CNC mills to make furniture that's voluptuous rather than cold and geometric?" The answer is found in their L.E.D. Truncheon lamps, designed for Matter's in-house line, a warm wooden object created with a complex industrial milling process. By the end of the year they'll bring out a collection of wooden pieces that have a soft, almost quilted effect, and they're currently exploring the possibility of making an amorphous bookshelf with Ductal, an ultra-light concrete. "We do pretty weird work, at the heart of it," Coombes says. "But we want to make forms that have a presence."